May | 2010 | E-verything! Serendipity Webinar Overview – Maths anxiety and other matters! This week’s overview is a strange experience for me! I wasn’t there in the session (I was laid low by a migraine) but am still writing an overview. I can do this thanks, of course, to the recording, technology is a wonderful thing! It was one of those Serendipity sessions that happen occasionally where we don’t have many participants and so it is much more of a chat than a formal session. For me one of the strangest and most frustrating aspects of only being a spectator after the event was that I so much wanted to join the conversation! The discussion was mainly around issues of anxiety in teaching and learning maths with digressions into wider considerations of teaching and the need for teachers to be learners as well as teachers and to work across learning disciplines. Again the discussion turned as so often to motivating and empowering colleagues as well as students. The question of teacher burnout and the balance between the risk of stalenes/boredom and being overwhelmed by the workload was also raised. For me as a listener after the event this was a very thought provoking discussion and one where I was longing to take part. Because this was so much a “conversation” the discussion was almost entirely through audio with some text chat and for me it was a session well worth listening to. Our next Webinar is an Edublogs “Fine Focus!” session a “Techie How To” on getting the most out of Elluminate Webinars from the participant’s point of view in “Be an ‘Elluminated’ participant“. If you would like to know more about the tools and options available to you when you attend an Elluminate session, or about how you as a participant can help the session flow more smoothly then this session is for you! 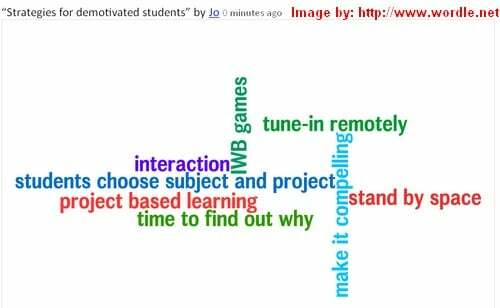 The recorded Edublogs webinar of the 20th/21st of May was a fantastic session led by guest presenter Lynne Oakvik of the Learning Resources and Instructional Media Department, Broward County Public Schools, Florida. I really enjoyed this session for the content and activities but also because I was able to participate more in text chat than is often possible while Lynne led the session ably supported by Phil Hart. After the usual preliminaries and some introductory words from Lynne she took us straight to the heart of the matter by asking us to brainstorm the factors influencing student motivation. We had a very full whiteboard very quickly! All in all this was a very interactive and thought provoking session and our thanks go to Lynne for giving us all such food for thought in such an effective way. As with most of these sessions this overview is no more than a fleeting glimpse and you will get much more from the recording. Our missing recording has been found and is now available – Thank you to the Elluminate Support Team for their persistence finding this long after I had given up! A combimation of pressure of work and miscellanous other issues including a lost recording for the first of these two sessions meant that I got so far behind on the overviews that this week I have done a combined overview for the week with the lost recording (Students are Students) and the following week’s Serendipity session. 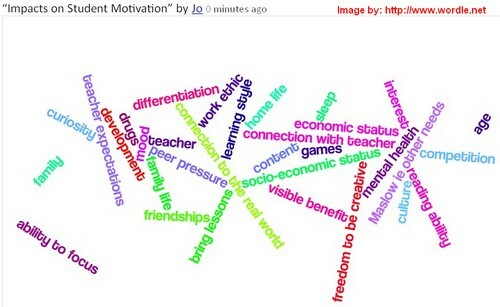 I will also be doing a separate post for the most recent webinar on motivating students. Unfortunately we have no recording available for this session which was very lively. Also I’m sorry for the delay in posting about this webinar but I was hoping that the recording would become available. If the recording goes eventually become available I will add it to the post and Tweet this. The post will be longer than usual because of the lack of recording, and will try to describe the activities and outcomes in rather more detail than the usual overview. The focus of the session was on classroom management issues and on drawing some parallels between these issues in a face-to-face situation and in the virtual context. We began by inviting people to put their main classroom management issues on the whiteboard. Then we grouped them to try and put similar ones together. This was slightly arbitrary as there is certainly a case for combining the “need/relevance” group with the “motivation/interest” group in that perceived irrelevance impacts on motivation. In my personal opinion, a perception that the class/work is not relevant is not the only reason for poor motivation and/or a high level of disinterest. So we ended up with six issues: behavioural; motivational; perception of need/relevance; attendance; parental pressure; differing “level”. Using a series of polls we narrowed these down as it was not practical to consider them all – lack of motivation was a clear winner, we also took a brief look at the behavioural issue. In both cases we whiteboarded some of our own strategies for managing lack of motivation, mainly in a face-to-face context. Several of these were described in much more depth by people who used them giving us a great “feel” for how they worked in a particular context. We also touched briefly on barriers to implementing some of these strategies including: the heavy demands made on the teacher by project based learning; and the requirement in some places for “seat time” where students have to be in class for set times – this precludes time-out options. In the short time left before the end of the session we talked about managing potentially disruptive behaviours whatever the cause in both the face-to-face and virtual environments. Again we used whiteboard, text chat and audio. As before a variety of strategies were suggested although we lacked the time to explore these in more detail. However there were a range of ideas put forward in text and audio as well as on the whiteboard. The almost continuous consumption by students of sweet beverages and “snack” foods high in sugar and other additives and the possibility of countering this by encouraging the drinking of water instead. An increasing trend for shorter breaks (recesses) and less physical activity undertaken within those breaks leaving students with excess energy that may be channeled into disruptive behaviour. Due to the time factor we didn’t really explore the behavioural issues in much depth. Although from my personal perspective they are much more significant in a face to face situation than is lack of motivation. 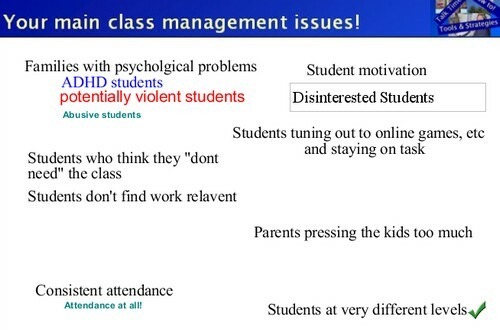 This is because in my opinion an unmotivated student impacts mainly on their own learning whereas a student showing disruptive behavior impacts negatively on the learning of all the others in the class. Of course unmotivated students often move into disruption for various reasons and then this becomes a behavioural issue. In a virtual situation it can be easier to manage disruptive students by simply restricting their access to tools and so limiting their impact on others. Luckily (from my perspective as we have no recording available) there were few links shared during this session. One of our participants Heidi Chaves suggested this book for a variety of classroom management strategies. Our regular Edublogs Serendipity unconference sessions are always enjoyable, not least because we have no idea at the beginning where we will go in our journey! On this occasion we explored our perceptions of the place of technology in the schools of today and tomorrow. For this session as usual we have a recording link that is well worthviewing. As often happens in these sessions the discussion was wide ranging touching on many of the well known issues around technology in education. This is very much the nature of the Serendipity sessions in contrast to our Fine Focus sessions where we endeavour to stay ”on topic”. In addition to audio and text chat we filled three whiteboards with thoughts and ideas! With lively sessions such as this using the three communication strands of audio, text chat and whiteboard a post can only give a “taste” of the session, catch the recording for the full “flavour”. Edublogs Serendipity – unconference session where you bring along your hot topics and burning issues (what makes you spit with anger or thump a tub with passion) and throw them into the melting pot for the poll to choose our topic in the first ten minutes. This weeks Edublogs Serendipity “unconference” webinar (recording here) was lively and full of great contributions from participants through audio and chat as well as on the whiteboard. 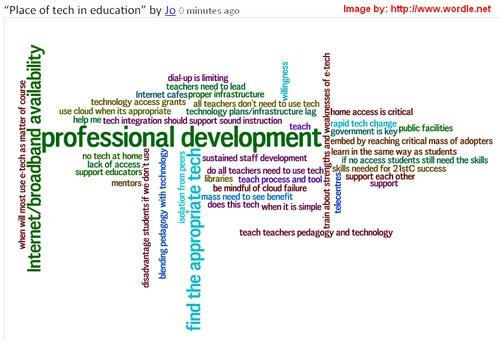 The topic of choice by a good margin was “useful suggenstions for Web2.0 Tools employed in the classroom”. We approached this by asking for favourites to be put on the whiteboard resulting a rapidly filled space and the potential for a great Wordle! We then invited people to talk about those they had added to the whiteboard. This led to some great contributions about what the tools can be used for and examples of how they are being used in class. Of course we ran out of time and it just wasn’t possible to look at all the tools. 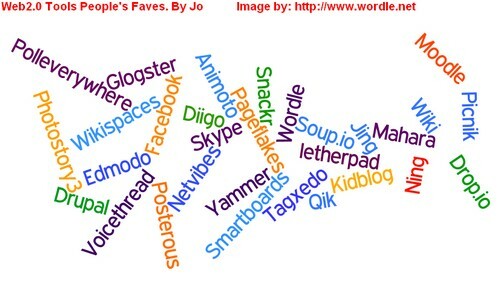 However it’s a terrific list of tools to explore with more (and some links to other lists of tools) mentioned in the blended audio and text chat conversation as you will hear/see in the recording. Overall a very interactive session which provided much food for learning and seemed to be enjoyed by all!